More HeroClix featuring your favorite Nuclear Men on the way! Coming February 4th, the DC HeroClix: Justice League Trinity War set will feature Firestorm and Deathstorm (from the Earth-3 Crime Syndicate)! Choose your Justice League and battle for the world’s salvation with DC HeroClix: Justice League – Trinity of Sin! Subthemes for DC HeroClix: Justice League – Trinity War include the Justice League of America, the Justice League Dark, the Crime Syndicate and more! Trinity War also freatures the first Seven Deadly Sins 3D Special Objects randomly inserted into boosters; these special objects interact with the Rock of Eternity and Pandora’s Box incentive resource dials. There are 73 figures to collect, including 17 Common figures, 16 Uncommon figures, 16 Rare figures, 12 Super Rare figures, 7 thematic Chase figures, and 1 Ultra-Chase figure. Build your Trinity War collection with Gravity Feed Foil Packs, the Dice & Token Pack (with 2 custom dice and 6 action tokens), the Booster Brick, or the Crime Syndicate Fast Forces Pack. Those are some gorgeous sculpts and paint jobs above. Given my experience with HeroClix, somehow I don’t think they’ll look exactly that snazzy in real life. For an incredibly detailed description of the characters abilities (we’re talking click-by-click), check out the WizKids preview! And be sure to pick up some DC HeroClix: Justice League Trinity War booster packs next month! 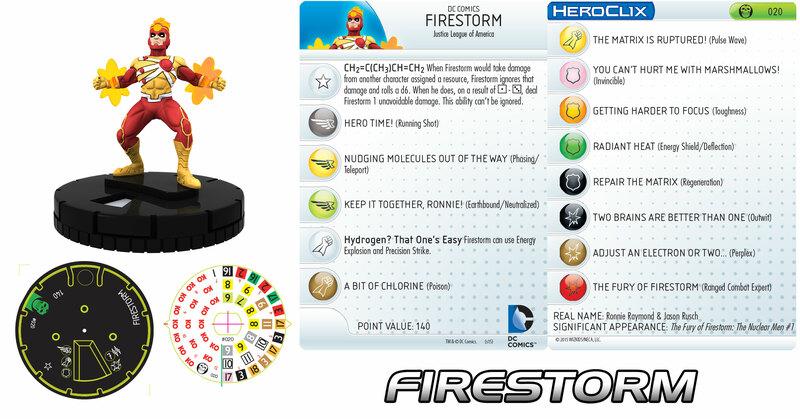 Support Firestorm (and HeroClix)! Fan the flame! Posted in: Deathstorm/Black Lantern Firestorm, Firestorm #10: New 52 v2 (Ronnie/Jason), Games, Justice League of America, Toys. Something about the proportions feels off on the Firestorm figure (is the head too big or are the legs too thick? Or both?). That’s a really great looking Deathstorm figure though. The black edging on the FS figure looks really great, but there’s no way that’s on the mass produced figure (I’d be happy to be wrong here, but I think we’ve all seen enough heroclix figures to know the answer). Maybe I should buy two and paint the black lines myself (gotta keep one in original condition eh ;)).